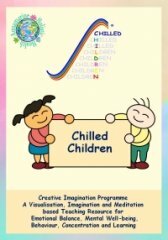 The Chilled Children and Chilled for Autism programmes provide teachers with a wide range of resources to help children to deal with mental and emotional difficulties, and give them tools for the future. This programme has been written using meditation, visualisation and clinical hypnotherapy techniques. Stuart and Amanda Jewell are a husband and wife team and parents of two wonderful boys.Their passion is helping people with Emotional and Mental Wellbeing. Amanda has a BA Hons in Combined Humanities, Reiki Master and Practises Yoga and Meditation. Stuart is a Clinical Hypnotherapist with Masters Diploma in Clinical Hypnotherapy. "This resource is a must for teachers who, from time to time, may need a quick 'pick me up' or 'calm down' session that will promote learning readiness but not take up a busy timetable. This is a no fuss simple resource, easy to use, follow and build into a hectic school day" Mrs Craddock, Headteacher, Hudson primary School, Maghull. A wonderful book that could benefit all teachers. Very good and perfect for the purpose! Teachers love, children love it. Beautifully written, put together and published. Teachers need this book, children deserve it. These books have taken a lot of time, energy and effort to create. They have been a labour of love. We sincerely hope that primary school teachers will continue to use them to help their pupils grow into more emotionally secure adults. We would like to thank everyone who has given us their support along the way, especially our publisher and her team, Christina Gabbitas of Poems and Pictures Ltd. Please vote for us if you know us, are interested in what we do or want to support teachers and children with our publication. Please also look out for Triangular Trev and vote for Christina. Thank you! Stuart and Amanda Jewell.